Representative Ilhan Omar, Democrat of Minnesota. 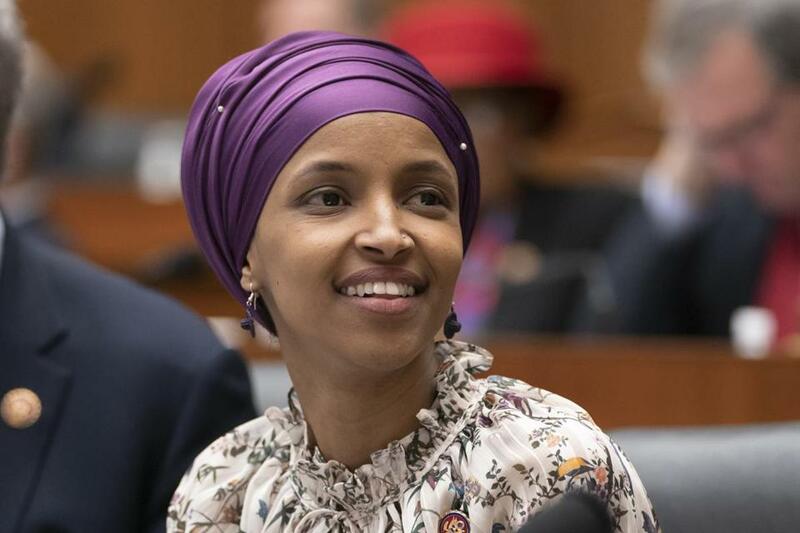 WASHINGTON — Top Democrats on Saturday rushed to defend Rep. Ilhan Omar after President Donald Trump retweeted video that was edited to suggest she was being dismissive of the significance of the worst terrorist assault on U.S. soil. House Speaker Nancy Pelosi scolded Trump for using the ‘‘painful images of 9/11 for a political attack’’ against the first-term Minnesota Democrat. ‘‘First Member of Congress to ever describe terrorists who killed thousands of Americans on 9/11 as ‘some people who did something,’’’ tweeted Rep. Dan Crenshaw, R-Texas. The retired Navy SEAL lost his right eye in 2012 in an explosion in Afghanistan. ‘‘Here’s your something,’’ the New York Post blared on its cover beneath a photograph of the flaming towers. Former Texas Rep. Beto O’Rourke, said the Republican president’s tweet was an ‘‘incitement to violence’’ against Omar, who is Muslim-American, and others like her. O’Rourke, campaigning in South Carolina, likened the tweet to Trump’s rhetoric about Mexicans, described in the past by Trump as murderers and rapists. O’Rourke said ‘‘there is a cost and there is a consequence’’ to Trump’s comments. Omar repeatedly has pushed fellow Democrats into uncomfortable territory over Israel and the strength of the Jewish state’s influence in Washington. She apologized for suggesting that lawmakers support Israel for pay and said she isn’t criticizing Jews. But she refused to take back a tweet in which she suggested American supporters of Israel ‘‘pledge allegiance’’ to a foreign country.